Before Andy and Barney can go, Ben Weaver (who I gather is a recurring character) comes in dragging Sam, who he accuses of brewing moonshine. Because Ben owns the department store, he wants Sam locked up as a warning to others who might try and make their own alcohol instead of purchasing it from him. Andy pushes back, but Ben threatens to make trouble with the state. Rather than keep Sam away from his family on Christmas, Andy arrests Sam's family on a charge of abetting the crime. Andy then deputizes his own family to excuse their presence in the station. The real plot line, surprisingly, follows Ben. 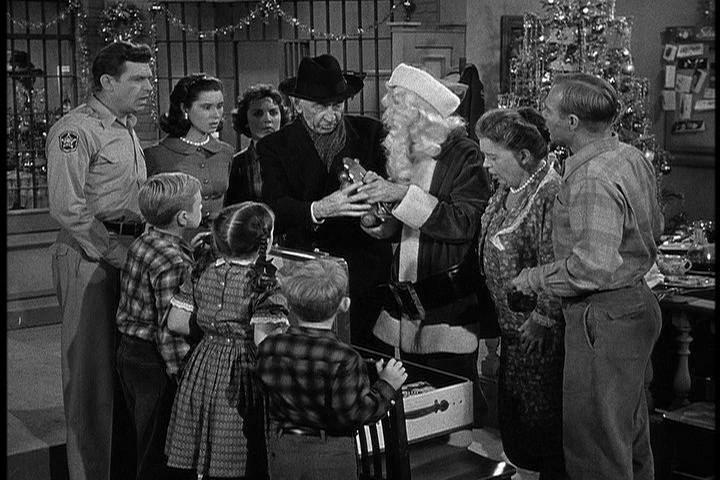 At first, he's angry that the sheriff's essentially throwing a Christmas party for Sam, but as soon as he sees the food and hears them sing, he starts committing minor crimes. Each time, he almost gets arrested, but is saved when Andy's girlfriend pleads his case. Eventually, Andy realizes that Ben wants to be arrested, so he can join in the party. On their way to the jail, Ben picks up presents from his store, which he distributes under the pretense he grabbed them by mistake. Over the course of the party, Ben drinks the moonshine and falls asleep happy in his cell. Since there's no more evidence, Andy sends Sam and his family home. The story line, thin as it is, is of course a pretty straight-forward Scrooge motif, albeit one that transitions in the course of just a few seconds. As such, the episode hinges on Ben pivoting from a hateful curmudgeon to a sad, pitiful old man, and the actor actually pulls off the feat. Likewise, the rest of the cast come off as good-natured and bumbling, and the editing - aided by some good music choices - sells the concept. There's really no substance here, but it makes up for it in charm. I didn't find this especially funny, but I still found it enjoyable to sit through: that's better than I'd have expected from this era of television. I probably shouldn't be so surprised - The Andy Griffith Show is well regarded. All that said, child actor playing Opie would grow up to direct the abysmal live-action Grinch. Granted, we're talking about Academy Award winner Ron Howard, but I really think The Grinch was bad enough to have overshadowed the rest of his career.